AGON, the annual management fest of IIM Ranchi was inaugurated on 29th September at Suchana Bhavan. AGON 4.0, a platform where some of the best minds of the country took part in competitions from different walks of management. With over 1500+ participants across various events, AGON 4.0 has captured extensive attention amongst management enthusiasts in various B-Schools. AGON experienced a footfall of about 700 on the first Day, which includes students from esteemed management institutions of India such as IIM Ahmedabad, IIM Bangalore, IIT Kharagpur, ISB, FMS, XLRI, IIM Calcutta, XIMB, NMIMS, IIM Indore, IIM Lucknow, IIT Madras and many more. The inaugural event started with lighting of lamp by Prof. K. N. Singh, Emeritus Professor, IIM Ranchi followed by a prayer song by one of the first year students. Speaking on the occasion, Prof. Singh expressed his delight over the enthusiasm and active participation that AGON has witnessed this year, and urged the students to consider this as a great opportunity of learning from practical experiences. The second and final day of AGON 4.0 started with Maneuver 4.0, a recruitment bidding competition organised by HiRe, the HR club of IIM Ranchi. 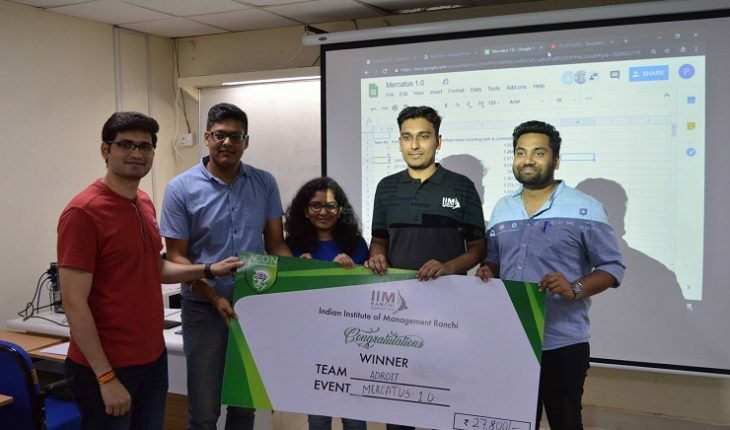 The event had more than 370 participants of which 6 teams were shortlisted for the finals, while Team Anusondhitshu from IIT Kharagpur emerged as the winner. The judge for the event was Mr.Akshat Gupta, a qualified Legal and Management professional. Agon 4.0 also saw Symvolous, the Flagship Case Study Competition of Conundrum, the Consulting Club, IIM Ranchi. Mr.PankajPandey, CEO at Vyapt Consulting Private Limited and Mr. Rajeev Gupta, CEO at Ranchi Mall were the judges for the event. From among more than 600 participants, the finalist teams were from IIM Indore – Mumbai Campus, Wellingkar, XLRI, IMI Delhi and IIM Ranchi, among whom Team Not Again from IIM Ranchi was declared winners. The E-Cell, IIM Ranchi organized EnCase 3.0, the Live Case Study Competition. The event was adjudged by Mr.SudhirKamath and Mr.SahajMonga, Manager from 9 Stacks. Finance Club conducted MERCATUS’18, a live floor trading competition where teams from top B-Schools of the country tried to maximize their profits by agile thinking, to capture the first-mover advantage, while team Adroit from IIM Ranchi won this competition. The Literary club organised Terra Nullius, a war of words against skilled opponents from across the nation. In the final round of Terra Nullius, teams delivered a pitch of 10 minutes on an agenda based on a contemporary socio-cultural issues that helped in drawing meaningful conclusions over the topics. Sankriya, The operations club of IIM Ranchi brought out Bizsim, an interactive live business simulation challenge. The event helped participants explore their decision making skills where they were given a challenge to forecast demand, set up a factory and compete in a market by introducing new production techniques and new products. QR Code – Quiz Club of IIM Ranchi came up with their first ever National Level General Quiz. Quizmaster for the event was Mr.Palak Kumar from Greycaps, who is India’s youngest professional quizmaster. HiRe went on to organise the Final Stint, to test creativity & delve deeper into art of negotiation. Participants had a great chance to combine their business knowledge and persuasion skills in this event. Agora-Halla Bolo BechDaalo!, organised by Marquess, the Marketing Club of IIM Ranchi was a path breaking competition in which teams were required to sell goods, helped by TV, radio and events. After two days of brainstorming activities and managerial events, AGON 4.0 ended with a cultural night, organised at Khelgaon Student Block. The participants from various institutes in the country enjoyed the final showdown while having a lot of learning experiences and memories to take back home, and thanked IIM Ranchi for giving them such a wonderful opportunity. The organizers extended their gratitude to the management of IIM Ranchi, the participants, sponsors and associates for their constant support and encouragement.